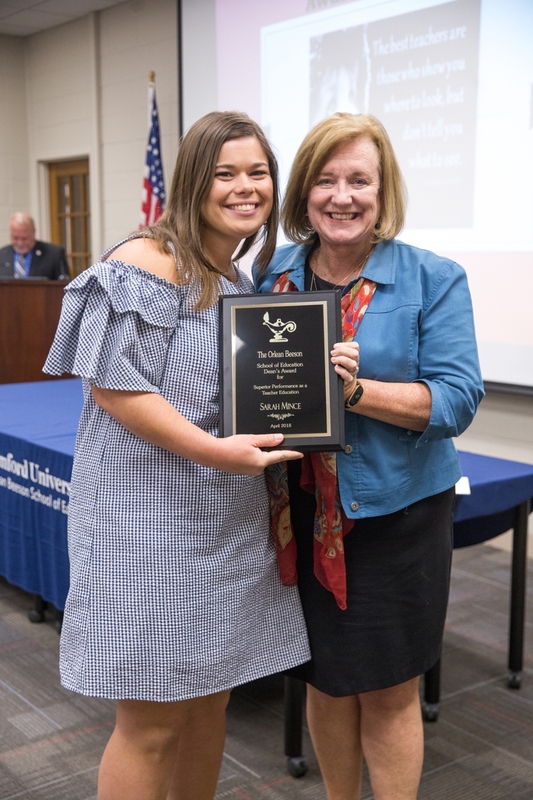 Samford University’s Orlean Beeson School of Education held its 37th annual teacher education award ceremony April 30 to recognize the many accomplishments of the school’s undergraduate teacher education students. Sixteen scholarships totaling more than $37,000 were awarded to students pursuing a career in teacher education. Guest speaker and alumnus Matt Kiser, encouraged students to recognize the importance of relationships with all stakeholders. “Research shows that one positive role model can change the trajectory for a student. I challenge you to be that one,” said Kiser. Mildred (Joyce) Bousack, a junior from Sylvan Springs, Alabama, received the Velma Wright Irons Memorial Scholarship, which is awarded to a student who has exemplified strong goals toward pursuing a career in education. Hannah Baker, a senior from Colleyville, Texas and Mallory (Nicole) Payne, a senior from Madison, Alabama received the Kathryn Abercrombie Scholarship, which recognizes a student who has achieved a high academic standing and exemplified outstanding character in the field of education. Mallory Payne was also awarded the Anne Glaze and William C. Stone Scholarship, which was established in memory of Charles R. Glaze and to honor Ila G. Glaze. Caroline Dymond, a freshman from Pike Road, AL and Jessie Gholson a junior from Nashville, Tennessee were awarded the Cooper and Dark Endowed Scholarship. This scholarship is made possible through the generosity of Edwin W. and Billie B. Bleier, who give in memory of their aunt and uncle, Jo Cooper and Henry W. Dark. Both Cooper and Dark served as teachers throughout their professional careers. Lauren (Bailey) Sharp, a junior from Hueytown, Alabama, received the Alabama Power School of Education Endowed Scholarship, which was given in honor of Rev. Terry W. DeFoor. Callie Addington from Jasper, Georgia received the John and Frances Carter Endowed Scholarship. Colby Kuhn, a junior from Knoxville, TN was awarded the Brookwood Baptist Nila Graham Campbell scholarship. The scholarship is awarded to a deserving undergraduate student, with preference given to those students pursuing a degree in Early Childhood Education. Ralph and Orlean Bullard Beeson, for whom the school was named, established several scholarship awards to recognize academic excellence, leadership, participation in campus activities and professional promise. This year’s recipients were Annie (Scout) Brasfield, a sophomore from Hoover, Alabama; Anna Fiorucci, a sophomore from Harvest, Alabama; Samantha Greenblatt, a junior from Grayson, Georgia; Sara Ines, a junior from Tampa, Florida; Rachel Loughney, a junior from Navarre, Florida; Lauren Sizemore, a sophomore from Trussville, Alabama; and Margaret Hohfeler, a senior from Coppell, Texas. The Academic Achievement Award is awarded to students with the highest GPA for their year of study in their selected program. This year, the Early, Special Education, Elementary Childhood Collaborative program junior class recipient was Bonnie Hankins, from Rock Spring, Georgia. The senior class recipient was Julia Bickley, from Edmond, Oklahoma. The Secondary Education program recipient for the junior class was Mackenzie Epps, from Buford, Georgia; and the senior class recipient was Ashlyn Lett, from Pell City, Alabama. The Martha B. Ralls Most Promise as an Exemplary Teacher recipients were seniors Macy Sarver from Saint Petersburg, Florida and Sally Stunkel from Boynton Beach, Florida. The Most Promise to be a Teacher Leader recipients were seniors Jacklyn Keller from Vinemont, Alabama, and Ashlyn Lett from Pell City, Alabama. Mallory Killam, a senior from Pensacola, Florida, won the Kappa Delta Pi, Zeta Theta Chapter Award for Excellence in the Field of Education. Tom Yan, a senior from Sterrett, Alabama, won the Ira F. Simmons Award. Jessica Ray, a senior from Alpharetta, Georgia, received the Award for Outstanding Innovative Practice in P–12 Education and Hannah Baker, a senior from Colleyville, Texas, received the Carol D. Dean Award for Outstanding Service. The John and Frances Carter Award for Teaching Excellence is awarded annually to four students who exemplify excellence in their chosen teaching area. This year, senior Makenzie Krantz from Carrollton, Texas, received the award for early childhood education. Junior Mildred Bousack from Sylvan Springs, Alabama, received the award for elementary education. Senior Gabrielle Durik from Franklin, Tennessee, received the award for special education. Senior Anna Miller from Lookout Mountain, Georgia, received the award for secondary education. Newton also presented the 2018 Golden Apple Award Lindsay Wiseman Self of Brentwood, Tennessee. The Golden Apple is presented annually to an outstanding alumni educator who has shown excellence in and outside the classroom since graduation. Self completed her Bachelor of Science degree in Early Childhood, Special Education, Elementary, Elementary Collaborative (ESEC) at Samford. She is a special education instructor at Fultondale Elementary and was recently named a Top 5 Finalist for Jefferson County Teacher of the Year. Following the awards ceremony, education faculty, staff, scholarship recipients and scholarship donors gathered for an appreciation reception for fellowship and to celebrate the many accomplishments of our students this academic year.